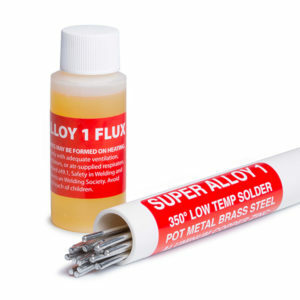 Repair cracked or cut pot metal parts at 350º with MuggyWeld Super Alloy 1 multi-metal solder. First, use a Dremel to prepare the area before beginning torch work. We were aware that the previous solder could loosen if we didn’t stop the heat from spreading, so for this application, we used HEAT FREEZE HEAT PASTE to stop heat transfer and to protect an existing solder repair in an adjacent area. After use, simply return HEAT FREEZE HEAT PASTE to its jar and reuse.